You can use a large plastic storage box or plastic foam ice chest instead of a cardboard box if you prefer. Mark the eggs in pencil with an X on one side and an O on the other, so you can keep track of which way you're turning them. 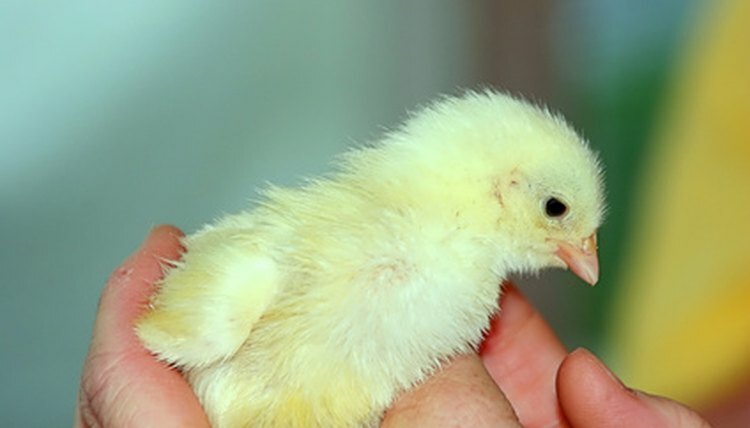 The best incubator for a fertilized chicken egg is a broody hen. With no help from the outside world, the eggs are turned, kept at the proper temperature and cared for once they’re hatched. However, a good broody hen is rarely around when you need her, and she can only sit on a certain number of eggs. By incubating the eggs artificially, you can hold as many eggs as you’d like (assuming the incubator is large enough) and you can watch them hatch, providing any nearby children with an entertaining learning experience. Remove the lid from the box. Place the box on a flat surface with one of the long sides facing up. Measure and mark 2 inches from the edge all the way around that side, then cut away the cardboard inside the marked area, creating a framed opening in the long side of the box. Place the glass over the opening and secure it with tape. Seal the edges of the glass with additional tape to prevent air from coming in or out. This will be the incubator viewing window. Turn the box over so the glass is on the bottom. Measure and cut a hole for the light socket in the side of the box opposite the glass. Make sure the socket is located toward the edge of the box and not in the center. It’s best to cut it a bit too small and enlarge as needed; the socket should fit snugly inside the opening. Insert the socket from the inside of the box by running the electrical cord through the hole and pulling the socket through. Secure the socket with tape and seal the edges so air cannot get in or out. Screw in the light bulb. Turn the box so that the glass is now located at the front and the light bulb is the back. Attach the thermometer to the inside of the box, securing it with tape. Place it on the same side of the box as the light socket, but as far away from it as possible. Make sure you can see the thermometer through the glass. Fill the pie tin with water and place it in the bottom of the box. Put the eggs in the box, next to the water. Plug the light in and turn it on. The light bulb will help to generate and maintain heat inside of the box. Put the lid on and ensure it fits tightly. If the lid is loose, tape some additional material along the inside edges to make it a bit smaller. Do not tape the lid, as you will have to have need daily access to the eggs. Wait three to five hours and check the thermometer. The temperature inside the box needs to be between 103 degrees and 106 degrees. If the temperature is below 103 degrees, air is getting into the box. Add more tape to the glass and the socket, or you can switch to a higher wattage bulb. If the temperature is over 106 degrees, switch to a lower wattage bulb. Open the box every morning and turn the eggs over. Do it again in the evening. Turning the eggs helps the chick develop properly; each time you turn the egg, the chick readjusts its position. Check the water pan every day to make sure it does not run dry. Sprinkle the eggs with water from the pan at least twice a week. Wait approximately 22 days for the chicks to hatch.